Check you are using a high quality alkaline battery (for example Duracell or Energizer). Check battery life. Ensure the cable end is clean of dirt or grease and that it is fully inserted all the way into the lock hole. You should also hold the cable in the lock hole at the same time as turning the key. Sometimes, particularly when new, the cable requires gentle force to fit into the lock hole. 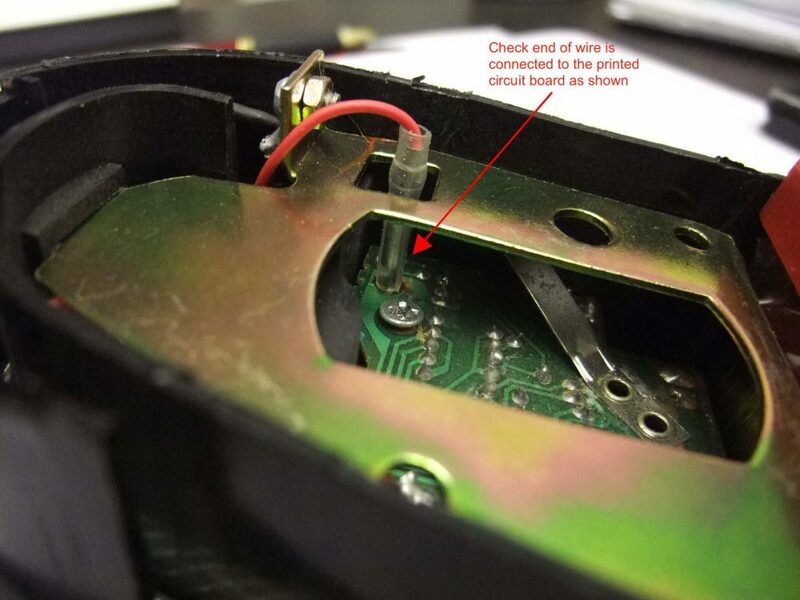 If the problem still persists, open up the front cover of the lock and check the red insulated wire is connected to the electronic circuit board (as shown on the photo below). If it has become detached, then reconnect the red insulated wire to the circuit board. Where is the lock hole? On the front between the lock and the red cable clamp is a small plastic flap. Lift the flap up to reveal the lock hole. You may need to release the red cable clamp first to access the flap. Firstly ensure the lock cylinder/key is in the unlocked position. With the cable unwrapped locate the two release tabs (as shown in the instruction manual) and using a small screwdriver gently press one of the release tabs whilst easing the cover away from the base. If this is not successful try the same procedure with the other release tab. How to test the alarm? Turn the key to the locked position without inserting the end of the cable into the lock hole – the alarm should sound within a few seconds. Check you are using good quality batteries, preferably Alkaline (such as Duracell or Energizer). Check battery life. Firstly ensure the key is inserted into the lock and the unit is unlocked. Secondly, ensure the battery cover retaining screws are removed. Sometimes, when new, the battery cover is quite a tight fit and may need some gentle force to remove it. If still unsuccessful then try using a small flat head screwdriver to gently lever the end of the battery cover from the main lock body. First, lock the cable into the main lock unit. Then using the end of a pen or a very small screwdriver press push the recessed test button (located under the warning label in the position as shown in the photo below) and keep this button held down. The alarm should start to sound. To turn off the alarm simply unlock the cable using the keys. Check battery life, and replace batteries if necessary. If battery life is OK, remove and refit batteries to reset. Sometimes the cable might not always sit neatly on the retracting spindle inside the unit and therefore not all the cable will retract back inside. In such a circumstance, hold down the cable trigger button and gently pull some of the cable out again, then allow it to retract back slowly into the unit. Repeat several times if necessary pulling out less cable each time. First change the batteries as when the batteries are running low the sensitivity of the movement sensor electronics can sometimes be affected. In addition the movement sensor can also be affected by the position the lock is in, for example if the lock is placed horizontally then it may be less/more sensitive than if it was placed in a vertical position. Please make sure the numbers on the combination wheels are exactly in line with the arrows. Sometimes when new the release mechanism and cable end are a tight fit and it can sometimes be helpful to wiggle the metal cable end as you press down the release button. If a new combination code had been set prior to locking then it may be the new code was not set correctly (perhaps the combination set button was not pressed in all the way before the new code was set) or possibly one or more of the numbers was not exactly in line when the reset button was pushed back. Try for each combination wheel the numbers +/- 1 either side of the code that was set or a variation of this. Failing this the only method is to work methodically through 001 – 999 until you find the correct code. Firstly ensure the key is inserted into the lock, the unit is unlocked and the U-shackle is fully removed from the main lock unit. Secondly, ensure the battery cover retaining screws are removed. Sometimes, when new, the battery cover is quite a tight fit so try using a small flat head screwdriver to gently lever the battery cover from out of the main lock body. First change the batteries as when the batteries are running low the sensitivity of the shock sensor electronics can sometimes be affected. In addition the shock sensor can also be affected by the position the lock is in, for example if the lock is placed horizontally then it may be less/more sensitive than if it was placed in a vertical position. First, lock the U-shackle into the main lock unit. Then press the shock sensor activation button. After the “beep” sound wait approximately 10 seconds for the shock sensor to become active. Then violently shake the lock unit or hit the main unit hard several times with the palm of your hand. The alarm should start to sound. To turn off the alarm simply unlock the shackle using the keys. Firstly ensure the device is unlocked and the lock cylinder is protruding out of the top. Secondly, ensure all four retaining screws are removed from the bottom of the device. Sometimes, when new, the top and bottom parts of the device are quite a tight fit so try a “rocking” motion on the top section as you pull it away from the bottom section. Alternatively, use a small flat head screwdriver to gently lever the top part away from the bottom part. First, push the lock cylinder down until the lock cylinder clicks into its ‘locked’ position and stays down. Wait approximately 10 seconds for the shock sensor to become active. Then violently shake the lock or hit the device hard several times with the palm of your hand. The device should start to ‘beep”. Continue to violently shake or hit the device and the alarm should then start to sound. To turn off the alarm simply unlock using the keys. If the padlock is new, make sure the battery protector strip has been removed from the battery compartment. Check the battery pack matches the correct polarity (+ to + and – to -) in the battery compartment. Ensure the battery pack is also fully fitted in the battery compartment. If issue persists then check battery life, and replace batteries if necessary. If battery life is OK, remove and refit battery pack to reset. Firstly ensure the padlock is unlocked and the shackle is released. Secondly, ensure the two retaining screws are removed. Sometimes, when new, the top and bottom parts of the padlock are quite tightly fitted so try a gentle “rocking” motion on the top section as you pull it away from the bottom section. Alternatively, use a small flat head screwdriver to gently lever the top part away from the bottom part. First change the batteries as when the batteries are running low the sensitivity of the shock sensor electronics can sometimes be affected. In addition the shock sensor can also be affected by the position the padlock is in, for example if the padlock is placed horizontally then it may be less/more sensitive than if it was placed in a vertical position. (1) Insert the key into the lock and unlock the padlock to release the shackle. Then rotate the shackle about 10-20 degrees so the end of the shackle is slightly to one side of the lock. Push the shackle down and you should hear the alarm start to sound. To stop the alarm simply pull up the shackle. (2) Lock the padlock as per the instructions. After the “beep” sound wait approximately 10 seconds for the shock sensor to become active. Then violently shake the padlock or hit the padlock hard several times with the palm of your hand. The alarm should start to sound. To turn off the alarm simply unlock the padlock using the keys. Ensure the storage tray is fully inserted into the outer casing and the lock hole in the storage tray aligns with the lock hole in the outer casing. Ensure cable end is inserted all the way into the lock hole. You may also need to hold cable in lock hole at the same time as turning the key. A sensor is integrated into the HandiSafe to detect forced entry attempts. Sometimes, particularly if carrying heavy items inside the HandiSafe or if the cable or storage tray is being jerked strongly during carrying, then the alarm may very occasionally sound. Simply unlock the HandiSafe to stop the alarm and then lock it again ensuring the cable end is fully inserted into the lock hole. If the storage compartment is too full then the tray may not close properly. If so then remove or rearrange certain items until the tray slides easily into the casing. If storing an iPad (or similar tablet PC), fit the shelf card first and then place the iPad/tablet PC on the shelf card with the screen facing downwards. Make sure the battery is fully inserted into the battery compartment. Sometimes the wires on the battery connector will curl up behind the battery when the battery is inserted into the battery compartment. This causes the area in the battery compartment to be reduced and not allow enough space for the battery to fit completely inside. 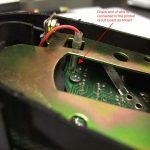 Therefore ensure when inserting the battery the wires on the battery connector slide smoothly back into the cavity at the back and to the bottom of the battery compartment. Ensure the cable end is clean of dirt or grease and that it is fully inserted all the way into the lock hole. You should also hold the cable in the lock hole at the same time as turning the key. Sometimes, particularly when new, the cable requires gentle force to fit into the lock hole. A sensor is located in the lid to detect forced entry attempts. Sometimes, particularly if carrying heavy items inside the PortaSafe or if the cable or lid is being jerked strongly during carrying, then the alarm may very occasionally sound. Simply unlock the PortaSafe to stop the alarm and then lock it again ensuring the cable end is fully inserted into the lock hole.